Twinfamy is the brainchild of John Pseudonymous, a stay-at-home trophy husband and father of boy-and-girl fraternal twins who were born in January 2011. Conceived while skydiving over Disneyland’s Pirates of the Caribbean ride, they are the two greatest children to ever walk the earth, aside, of course, from Jesus Christ and Chuck Norris. For five years, John was a middle school English teacher, but these two phenomenal fruits of John’s loins are destined for greatness, and he and his wife knew they cannot be cared for by just anyone. Therefore, John respectfully turned down his seven-figure teaching position in order to fulfill this illustrious duty, starting in June 2011. While completely redefining the tired convention of a “SuperDad,” John will simultaneously be fully active in a Ph. D. program, writing the great American novel, and curing cancer if there is still time, thus embarking upon an adventure unprecedented in the parenting community. This is his story. In addition to raising his children, John enjoys: spending quality time with the Mrs. (who exemplifies the term “soulmate”) in both clothed and unclothed scenarios; reading and writing (duh); listening to, writing, performing and recording music at levels that do not disrupt nap time; guerrilla filmmaking; following sports, as well as pretending to be a better athlete than his body permits; running with his children, dog, and wife in tow; tinkering with technology and throwing it against walls when it does not cooperate; patching up walls; building things while neglecting instruction manuals; experimental grilling; traveling places English is spoken fluently and/or creatively; trying to resist another round of Angry Birds; and attempting to make the world a better place than he found it. Twinfamy is written before a live studio audience…of two. your twins are two years younger than mine. . . I’m still alive! And you probably will be in two years’ time. The six to twelve period is pretty cool. Enjoy! Thanks Jared. I’ve often heard 6-12 is rad. I lucked out manning the household right as they’re becoming more interactive. Pretty stoked to see all the little milestones, and then, of course, pretend they’re doing them for the first time when my wife comes home. This is hilarious! Great blog…. It can be done. I am on the Ph.D register and my husband is about to embark on a degree. They say it is the best time to do it when the kids are young! Good luck with it all. Thanks so much! Yeah, we figure it’s better when they’re young, too. That way we’re more available to be obnoxiously vocal at Little League games and wield documentary-grade equipment as dance recital paparazzi. I love your blog. You are hysterical! You just got the dubious honor of being added to my blog roll! Thanks so much! I doubt it’s that dubious, though. Readers of this blog have phenomenal taste, so by extension, their blogrolls are often chock full of awesome as well. WhatIMeant2Say is, thanks for reading and sharing. You rock. In fact… Yep. My socks just flew right off. This is something totally new and awesome! (But I think if my dad had raised me I would have been handed over to the authorities.) Love your blog and pictures, your humor is really unique and entertaining. Thanks! Glad you enjoy it and hope you convert to Loyal Readership. We’re working on a benefits package I think you might be interested in. Fantastic blog! You have some very funny posts about your adventures in being a stay-at-home dad for your twins. I did that for my twin daughters’ first year — it was a fabulous roller coaster ride of emotion! Now I wish I had maintained a blog for the time. But it would not have been nearly as funny as yours. Keep up the great work — and best of luck on having your story turned into Twinfamy the Book or HBO series! Who needs hot vampires, when you can see a dad juggling the needs of infant twins?? But let me ask you this. What if the dad juggling the needs of infant twins…was also…a vampire? Just practicing my Hollywood pitch. I think it might need some work. Thanks so much for reading! Hope you stick around fo’ mo’. Thanks so much! I’ll have to check your blog out so I can see what to look forward to/dread in a decade. I hear they get older. Is that true? There is life after twins! My husband and I, along with our then 2-yr-old son, welcomed our fraternal twins – both girls – 29 years ago! It’s been a fun, rewarding and interesting ride. Enjoy the never-ending journey. Thanks so much, Jean! Thrilled to hear you enjoy it. It’s been a blast to write and to have such amazing Loyal Readers like yourself. I’ll keep it up as long as the Dynamic Duo let me. 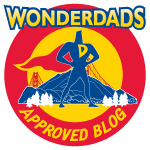 Oh My Goodness- You are officially my first SAHD Blog to visit. I can’t wait to read more! I might have to create a Daddy-Blogger Tab under my fave blogs Page! Thanks! You should probably do that, just to be safe. This blog contains information vital to everyone, and not reading it has been demonstrated to be a medically-proven symptom for lack of awesomeness. Just found your blog! Loving it! My husband is a SAHD with our 2 year old twin girls and their 9 week old sister. I will have to get him reading this! He can so relate! Thanks so much! When does my statuette arrive? Because if it’s coming via UPS I want to be ready. If that dude rings my doorbell while the Twins are napping, I’m chasing him down. I was expecting a statuette to arrive at my house via United Postal–but guess what? We don’t get one! :( Sorry to burst your bubble…I was informed that our KB Awards are ficticious….but it doesn’t stop our blogs from being on the Awesome List! Yay! Okay, well, as long as it’s the Awesome List, I guess it’s all right. They should really consider statuettes, though. So glad I found your blog. Certainly gives me a giggle when I’ve just spent half the morning chipping dried weetabix, off the kitchen floor. I have 8 month, boy and girl twins, and a toddler so know exactly where you’re coming from. Can’t wait to read more, keep up the fab work! Thanks so much! And kudos for doing the twin thing AND an additional kid. Sounds like your house is even more of a circus than ours. I love your blog! I am a mom of 5 my last 2 being fraternal twin girls who just turned 2 my my what an adventure! but I love it and wouldn’t have it any other way! good for you taking the plunge into stay-at homedom. Look forward to catching up on your posts! Thanks so much, and welcome! 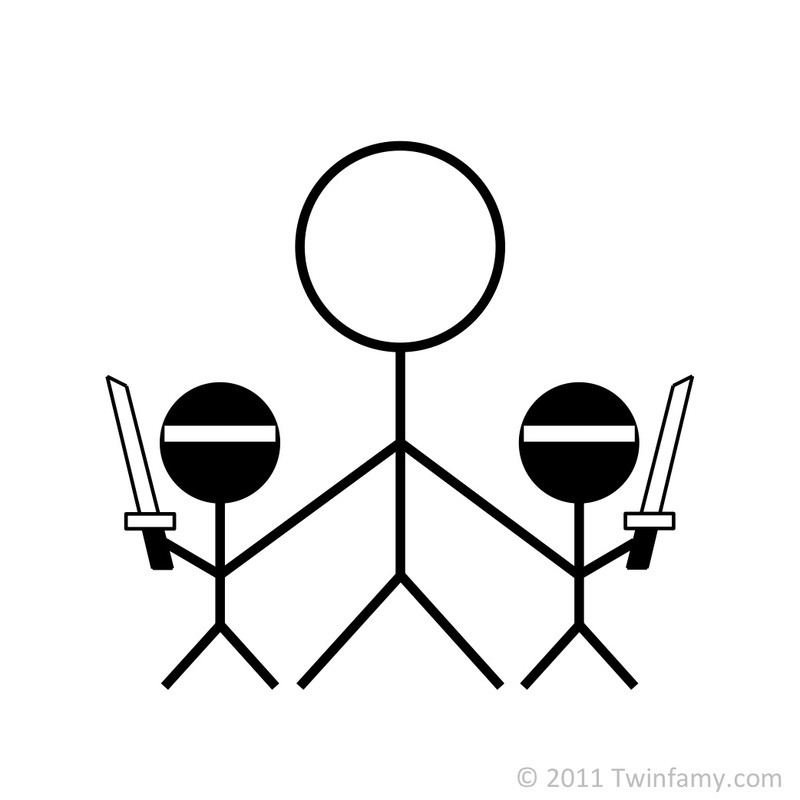 If you’ve survived that many kids and a set of twins on the tail-end, you must be a viking. I’m plenty busy with only my twins. Ha Ha a viking I like that! Thanks. Fantastic blog! I am an older sister to twin siblings and have cared for twin boys in my career nannying and even though I could ‘give them back’ at the end of the day I completely relate. Makes me giggle and think ‘haha so true’ every time I read it! So. Precisely who, or indeed what, was conceived? Were I a grammar nazi, I would of course have to say c. But that of course is no way to express admiration. While my gut tells me that sentence needs a revision, I have to say I’m impressed by your thorough literary analysis. Perhaps I should leave it open to interpretation. Which works for me because it means I don’t have to do anything. I agree. don’t do anything. Write your next post, I’m looking forward to it. All right! When does the statuette arrive? And can you tell me the dimensions? I need to make room on my shelf for it. It’s made of this incredible new substance that has been discovered – you can’t feel or see it! It’s 1m X 1m X 5m high! So you should really start clearing space for it now… It will be with you by Monday! Wow! Dad joke if ever there was one. My twins are currently four years old and yeah a handful. Love this blog from a daddy perspective! Delightful and inspiring blog, the wonderful commitment you have shown towards your beautiful twins is wonderful. I look forward to following your journey with your children in tow. Have a wonderful night, Allie. That is so super sweet of you. Thanks so much! Thanks. I’m not sure how I’ll cash the enormous check. I’ll have to ask my bank how they handle that. OMG I love this intro! You’re hilarious. I think your blog could appeal to anyone… even those of us 20-somethings who don’t have twins… but maybe someday!! This is great. I’m so thrilled to hear that, because that’s how I try to write every post–in a way that there’s sort of something for everyone. Thanks so much, and welcome! A very entertaining blog, I shall have come back for more so I have followed you in the meantime ;) My Dad is a twin and according to ‘The Tales’ they got worse as they got older…! I will consider it an honor. Thanks, and welcome! Looking forward to following you based on the posts I’ve read so far. I’ve just got the one 2.5 year old – intrigued to see how the joy and mischief are magnified. i’ve been a stay at home dad so know how rewarding it can be, i also know how hard it can be at times. I take my hat of to every single dad and mum who raise a child alone. Family time is the best time . That it is, my friend. Thanks for your support! Great About Me. Great Sense of Humor. Angry Birds….I discovered this app version of the game on my iphone when we were at the cottage this past summer…it’s sooooo, it’s just sooooo…good. Thanks so much! Yeah, I’ve weaned myself off it since I wrote this, but my kids have discovered it so it’s only a matter of time before I get back into it. Excited to find your blog! My twins were born in Sept 2010. Twin humor is my favorite! Dad blogs are a rarity. Definitely following. Thanks for the follow, but dad blogs aren’t very rare. Might I suggest the list of other blogs in this post for further reading? This is an truly excellent blog! My favourite blog experience so far… bearing in mind I have only been at it for less time than it takes to boo a goose. I’m hoping to find more gems like this little beaut! I always love hearing about families with lots of kids! Twins may be changeling but I’m sure well worth the time and effort you put into their lives. Keep up the good work! I found your blog in the recommended section on wordpress. So glad I did! I am a fraternal twin any ironically, my father’s name is John and he was a SAHD too. :) I can’t wait to send him your blog, I think he’ll get a kick out of it.